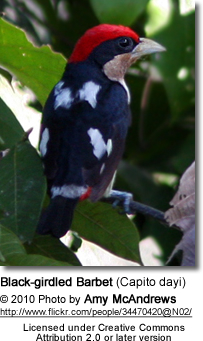 American barbets, family Capitonidae, are found in the tropical forests of Central and South America. They do not migrate. They are closely related to the toucans. The American barbets tend to be plump with large heads and short necks. Most barbet species are brightly colored. They are named from the bristles which fringe their heavy bills. 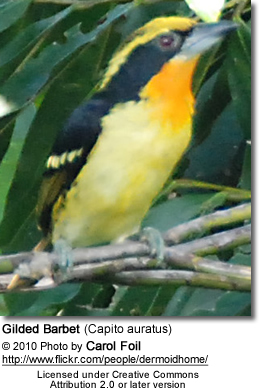 Most American barbet species ilive in lowland forests. However, some species range into montane and temperate forests as well. Most of them remain in habitats containing trees with dead wood, which they use for nesting. 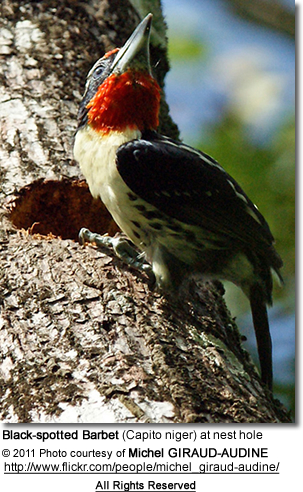 American barbets nest in tree holes dug by breeding pairs. The average clutch consists of 2 - 4 eggs. They have a varied diet, but the bulk of it consists of fruit. Al barbet may feed on as many as 60 different species within its range. Fruits are eaten whole and indigestible material such as seed pits are regurgitated later. 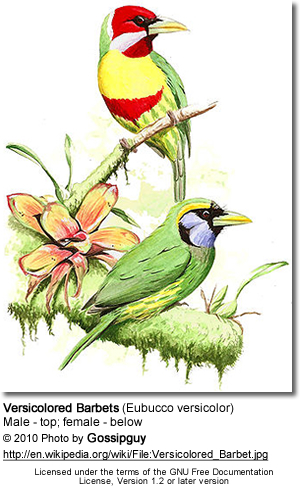 American barbets are thought to be vital agents in seed dispersal in tropical forests. They also eat insects, such as ants, beetles and moths; as well as scorpions and centipedes, frogs.and small prey animals, particularly when they are nesting. They also visit gardens and plantations, feeding on cultivated fruit and vegetables.